We’ve talked before about how some Comfort TV shows ended with an episode that provided closure for its characters and its viewers. But these were the exception. From the 1950s through the 1970s, most series just stopped. 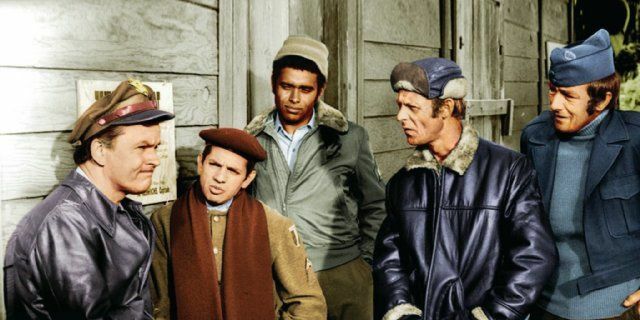 Of these, the one that still bothers me most is Hogan’s Heroes. It doesn’t take decades of hindsight to wonder why we were not shown how the end of Germany’s involvement in World War II played out at Stalag 13. Was the creative team caught off-guard? Hardly. According to Brenda Scott Royce’s fine book on the series, everyone knew the show’s sixth season would be its last. There was an eagerness to get the series into syndication, which offered higher profit potential, and a time-slot change had further cut into already sagging ratings. The only plausible reason it didn’t happen was a concern over how a finale would impact the series in syndication. This was also an issue with The Fugitive, as producer Quinn Martin worried no one would watch the reruns because they knew how the show ended. And perhaps that concern was warranted, as The Fugitive rarely aired in syndication, while Hogan’s Heroes played for the next 20 years. Very different shows, of course, and had Hogan’s shot a final episode I can’t imagine it would have diminished the show’s enduring appeal. How would it unfold? Here’s my version. In the opening scene, a message is sent from London to the heroes’ underground radio: Hitler has killed himself and Germany has surrendered. Hogan would make the announcement to LeBeau, Newkirk, Carter and Baker (Ivan Dixon, who played Kinchloe, did not return for season six). There would be much joy and celebration, and a discussion about what they all planned to do now that their treacherous assignment has ended. And unlike the show’s creative team, this is a moment Hogan will have anticipated. Sure, he’ll say, now we could wait for the Allies or walk out the front gate, but it seems more fitting to make a final exit from Stalag 13 through the tunnels, disappearing for the last time into the German countryside. But before departing, they’d ask for a word with Sgt. Schultz. Hogan would be content to leave true believers like General Burkhalter and Major Hochstetter to their fates. 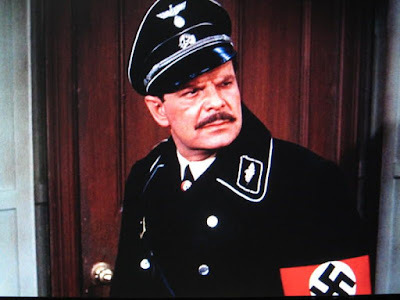 Particularly Hochstetter, the Gestapo leader who was as nasty a piece of work as the show could introduce in a comedic premise. But Schultz never wanted to be a Nazi. As revealed in the episode “War Takes a Holiday,” before the war he had been the owner of the Schatzi Toy Company. And while he had plenty of stomach he certainly had no stomach for war, or the despicable agenda of his Führer. So Hogan would offer him and his family safe passage to London or America. Or, if he preferred to stay, they would use some of their appropriated funds to set him back up in the business he left after being drafted. Great sitcoms can handle serious moments, and here would be an ideal opportunity to reveal what was obvious to attentive viewers all along: Schultz was never as dumb or as innocent as he presented himself. A clueless clown couldn’t build the largest toy maker in Germany. He was making the best of a terrible situation, trying to stay alive and away from the Russian front. 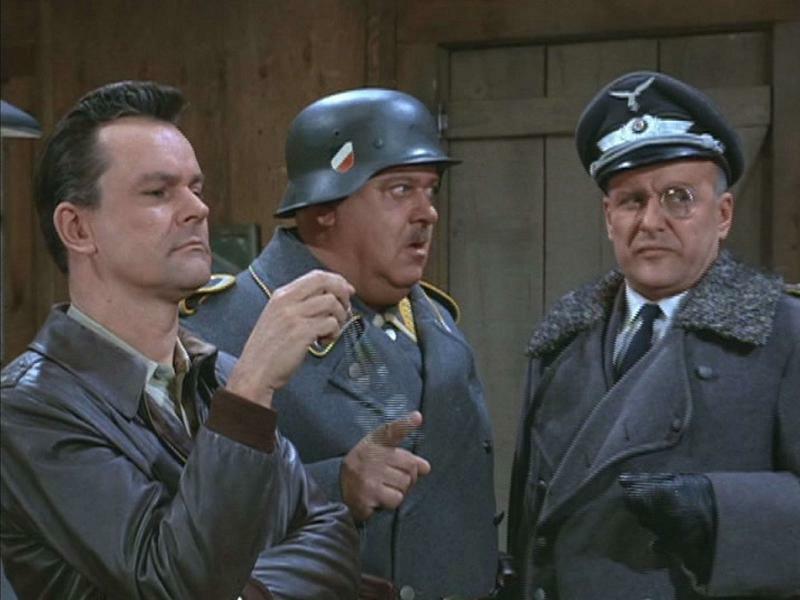 But what of Colonel Klink, whose ineptitude was even more decisive is securing an Allied victory? The easy option would have Hogan making one last unannounced visit to his office, with a “guess what we’ve been doing all this time?” revelation. But that seems too obvious. 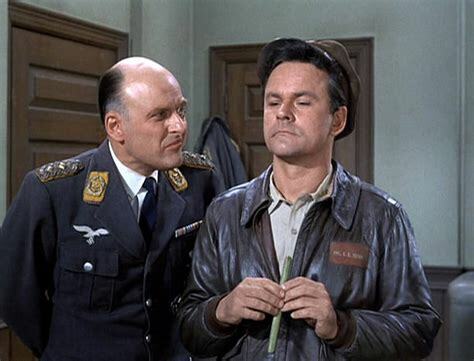 There could be an ironic twist of Klink finally making General – having one of the most unqualified German officers in the military not only surviving but advancing despite his incompetence – sort of like how The Mary Tyler Moore Show ended with Ted Baxter as the only WJM News employee who wasn’t fired. But I’ve always imagined something more poignant so Werner Klemperer, who won multiple Emmys for his portrayal of Klink, could also play a moment revealing the man beneath the buffoon. Klink calls Hogan to his office to share a glass of champagne and toast the end of the war, but by then Hogan and company are already gone. But before they leave, they expose every aspect of their operation, which is finally discovered by the clueless commandant. We watch as Klink walks silently through the now-abandoned camp, its tunnels laid bare, along with the maps and the coffee pot listening device, the stockpile of German uniforms, the printing press, the sliding barbed-wire fence and the hinged doghouse. As he realizes what a fool he’s been all this time, an overhead crane shot would pull out from Klink standing alone with this thoughts. Gradually his incredulity turns to a smile, and perhaps even a laugh, as he enters Hogan’s quarters and offers an acquiescent salute to a superior adversary. We then cut to Hogan and company in Paris – joined by Marya and Tiger and maybe even Colonel Crittendon. The episode would conclude in Washington DC, with Hogan and his men in dress uniforms receiving medals for their efforts in helping to win the war, as the stirring strains of Jerry Fielding’s march emanate from a military band. What do you think? Love it? Hate it? Think you could do better? You probably could. But if you’re not impressed I’m happy to direct you to yet another version, created a few years back by Mitchell Hadley at the It’s About TV blog. He plays the story out into the Korean conflict, the Kennedy administration, and up to the 1980s. He was always more ambitious than I am. I love your take on this, particularly how Schultz admits that he "knew something" all along. It seems like the perfect ending for him, and I think you're absolutely right that he never bought into the Nazi propaganda. I like your idea of how Klink reacts to it too, though I admit I have a soft spot for the idea of Hogan and Klink having a final scene together. (Maybe I am just a big softie after all.) I don't think Klink was really a Nazi either (for all of his bluster, look at how he recoils when a visiting Nazi threatens some kind of torture or other dire punishment), and there are times - the end of "The Big Broadcast," for example, where Klink gives Hogan the champagne to thank him for fixing him up with Bertha - when Klink seems to do more than just cross the line of fraternization, to an act of actual friendship. Maybe it's just me. Great stuff - and thanks for the link! I believe you are right in that Klink was open to friendship with Hogan, a man he admired, but in my opinion the feeling wasn't mutual. To Hogan, Klink was a dupe - a means to an end and nothing more. 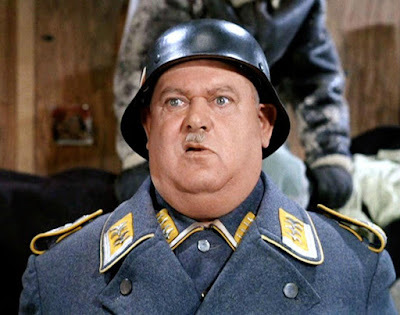 The other difference between Klink and Schultz, to me, was that Klink was ambitious. He wanted to be a general, he liked sucking up to the brass and having his name bandied about in Berlin. And that comes too close to an endorsement of their acts. Schultz, on the other hand, had no use for any of them. But I may be overlooking episodes that contradict this. I've never bought the argument that wrapping up a show's storyline would impact its syndication potential. Did anyone ever sit on their seats wondering if the castaways were going to be rescued or the Robinsons would make it home? The most logical explanation for "The Fugitive" not being successful in syndication is that all but the last season was shot in black and white. 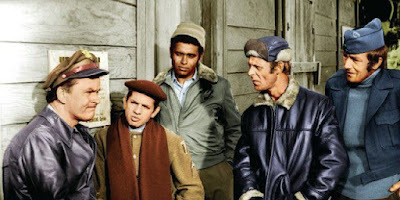 While many shows with one season in black and white and subsequent seasons in color had long second lives those shows whose lifespans predated 1965 pretty much all disappeared because viewers and local station managers alike were all a bit obsessed with color. I can distinctly remember my own grandmother angrily changing the channel when a B&W show came on, complaining, "I didn't spend $500 dollars on a color TV to watch black and white! I also suspect that the production crew of "Hogan's Heroes", like the majority of their contemporaries, were very much of the sausage factory mentality and the concept of closure simply never entered their minds. Lastly, unlike those of us who grew up on the "Hogan", I suspect many of the cast and crew of the show were bored if not embarrassed by the show and ready to move on. TV historian David Hofstede has written 12 books on television and pop culture. In 2003, his Charlie's Angels Casebook was adapted by NBC into a made-for-TV movie. If you enjoyed your visit to Comfort TV, you will also enjoy visiting these sites and blogs.